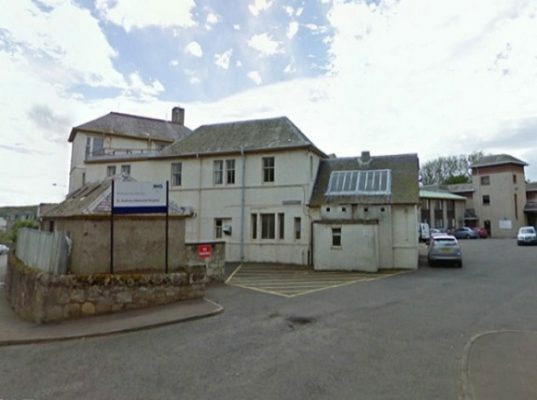 Central Demolition Limited were awarded the contract for the demolition of the existing pharmacy unit and psychiatric wards at the Southern General Hospital in Glasgow. This project included complex asbestos removal. These asbestos works involved extensive removal from the buildings’ undercrofts and service duct areas, both internal and external. The asbestos removal was certainly very challenging. This was due to external asbestos having to be removed under notifiable conditions in winter weather. 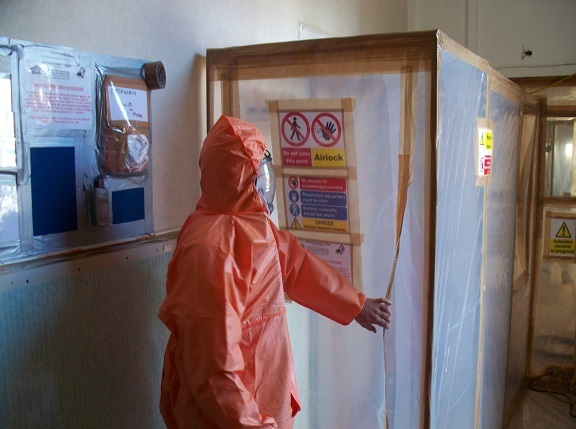 To allow for safe removal of the asbestos, extensive enclosures were constructed outside. 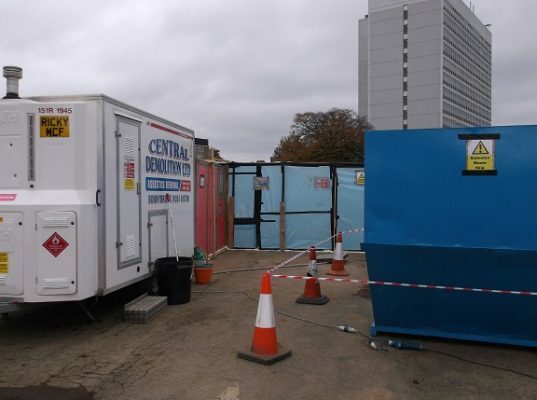 As is always the case, the asbestos removal works were carried out by one of our fully trained and experienced asbestos teams. In terms of other pre-preparatory works on this project, we also had to soft strip all of the buildings prior to demolition works commencing. The soft strip activity included the removal of medical equipment and medical journals. We also salvaged architectural chimney pots for the client. The demolition of the pharmacy unit included extensive services for the hospital. The psychiatric building which was constructed using sandstone was also demolished, and the works included the removal of all hard-standings, concrete services and foundations. There were challenges involved with the works, due to the site being located within the live Southern General Hospital grounds. Specialist dust suppression methods were utilised to minimise the impact of the demolition works on the surrounding environment. A live construction site was also fully operational nearby, in the form of Brookfield Multiplex’s new Southern General Hospital – so communication was an important factor on this project. 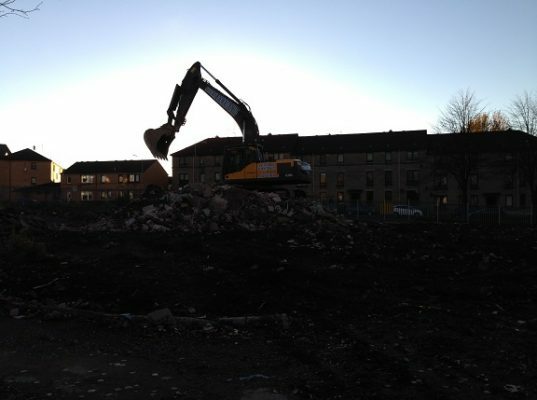 Further to the completion of the demolition works, we undertook a complete site clearance. Due to the site being within a live hospital environment, waste removals from site had to be staggered with visiting times to minimise disruption to hospital patients and visitors. Our client was attempting to achieve an excellent BREEAM rating for this site, and so all waste removed from site had to be documented and the client updated with waste quantities and recycling percentages on a continuous basis. Overall, a recycling rate of approximately 92% was achieved. Our effective planning, project management and high site standards led to this project being delivered safely, on time and within budget. BAM were satisfied with our progress on site and our high standards, and we have maintained a strong relationship with the key players involved in the project.